who knew that history could be so delicious? 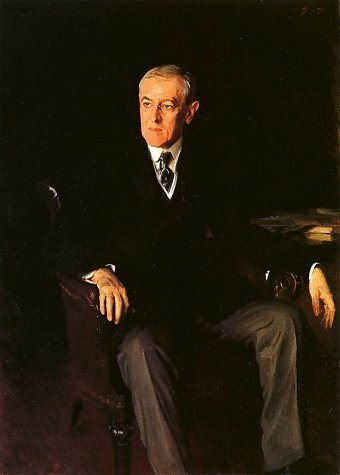 Following the outbreak of war in 1917, President Woodrow Wilson urged Americans to observe “Meatless Mondays” and “Wheatless Wednesdays” to help the war effort. He assured families that conserving food at home would help support our troops and allies overseas and feed starving people in Europe where food production and distribution had been disrupted by war. Food will win the war, and the nation whose food resources are best conserved will be the victor...A little bit of saving in food means a tremendous aggregate total, when 100,000,000 people are doing the saving. One wheatless meal a day would not mean hardship; there are always corn and other products to be used. Yet one wheatless meal a day in every family would mean a saving of 90,000,000 bushels of wheat, which totals 5,400,000,000 lbs. Two meatless days a week would mean a saving of 2,200,000 lbs. of meat per annum. One teaspoonful of sugar per person saved each day would insure a supply ample to take care of our soldiers and our Allies. These quantities mean but a small individual sacrifice, but when multiplied by our vast population they will immeasurably aid and encourage the men who are giving their lives to the noble cause of humanity on which our nation has embarked. Melt butter in heavy large pot over medium-low heat. Add onions; sauté until translucent, about 10 minutes. Mix in next 7 ingredients. Add cabbage; cook until cabbage begins to wilt, stirring often, about 5 minutes. Cover; simmer until cabbage is crisp-tender, stirring often, about 17 minutes. Uncover; add apple and apple juice and cook until apple is crisp-tender, about 5 minutes. FOOD FACT: In a chapter titled "WHEAT: Reasons Why Our Government Asks Us to Save Wheat," the Goudiss' wrote: A slice of bread seems an unimportant thing. Yet one good-sized slice of bread weighs an ounce. It contains almost three-fourths of an ounce of flour. If every one of the country's 20,000,000 homes wastes on the average only one such slice of bread a day, the country is throwing away daily over 14,000,000 ounces of flour — over 875,000 pounds, or enough flour for over a million one-pound loaves a day. For a full year at this rate there would be a waste of over 319,000,000 pounds of flour — 1,500,000 barrels — enough flour to make 365,000,000 loaves. Welcome to THE HISTORY CHEF!! Hi! I'm a literary agent, attorney and author who holds a Ph.D. in history from UC Berkeley. My books include MACHIAVELLI FOR MOMS (Simon & Schuster) and Forgotten Crimes: the Holocaust and People with Disabilities. I'm also a ghostwriter for a #1 New York Times bestselling author with 25 million copies in print and my work has appeared in the New York Times, the Los Angeles Times, The Wall Street Journal, and other publications, including USA Today, Newsweek, Parade, Forbes and The London Times. Welcome!! My Book - Machiavelli for Moms! from Simon & Schuster and hailed by Parade magazine as "a funny, creative new parenting guide." Evans humorously adapts the Renaissance political philosopher's sometimes ruthless precepts to running a family. So did you know that by the time he became president, George Washington had lost almost all of his teeth? Because of constant pain constant from ill-fitting dentures, he had to eat soft foods (like fish and hoe cakes) throughout most of his adult life. Contrary to popular belief, George didn't wear a set of wooden dentures. Instead, a talented dentist named John Greenwood hand-crafted his dentures with elephant ivory, hippopotamus tusks, and parts of human and donkey teeth. Eek! On November 1, 1800, John Adams arrived in the new federal city of Washington, DC and moved into the President’s House. The next day, while sitting in a damp, unfinished room, John wrote a letter to his wife Abigail which included a blessing for the new house and its future inhabitants. This is what he wrote: "I Pray Heaven to Bestow THE BEST of BLESSINGS on This House and All That Hereafter Shall Inhabit It. May None but Honest and Wise Men Ever Rule Under this Roof." More than a century later, in the final year of World War II, President Franklin Delano Roosevelt had these words inscribed in gold just under the mantle on the fireplace in the State Dining Room -- and Adams' words are still there today! Did you know that Jefferson’s vegetable garden at Monticello was 1,000 feet long and contained more than 250 varieties of more than 75 species of plants from around the world? Historians say that Jefferson’s favorite veggies were the English pea, Spanish tomatoes, sweet potatoes and French beans. Legend has it that in the 19th century, a freed slave named Sallie Shadd went into her family’s catering business in Delaware. Sallie supposedly achieved fame among the free black population there for a new dessert sensation she created with frozen cream, sugar, and fruit. When Dolley Madison heard about it, she supposedly travelled to Delaware to try it, and must've loved it because a “magnificent pink dome of ice cream” was served at President Madison’s second Inaugural Ball in 1813, and ice cream often appeared as the official dessert on the White House menu during her husband's two terms of office! Find my tweets about history, food, presidents, and books with some golf and cute fluffy kittens thrown in! In June 1817, two and a half months after he took office, President Monroe embarked on a "Goodwill Tour" of the United States. Paying expenses out of his own pocket, the new president was greeted by cheering crowds and treated to celebratory picnics, dinners, and receptions in every city he visited. After touring New York, Philadelphia, and Baltimore, Monroe stopped in Boston, where a newspaper hailed his visit as the beginning of an “ERA OF GOOD FEELINGS.” Despite this phrase, there were some bad feelings during this era, too. Free-states in the North and slave-states in the south were finding less and less to like about each other. The economy was also unstable and the nation slid into a serious depression in 1819. Andrew Jackson's victory in the election of 1828 was viewed as a triumph for the common man and popular democracy. During his two terms of office, just about anyone could come to Jackson's parties and just about everyone did! At his last public reception, a wheel of cheddar cheese weighing 1,400 pounds was devoured by a rowdy crowd in two hours. After that, the White House smelled of cheddar cheese for weeks! little Snapchat fun with your kids! Having witnessed the chaos of Jackson’s levees first hand, Martin Van Buren prohibited all food and drink from public receptions. Privately, however, Van Buren hosted many extravagant dinner parties at the White House. Using gold plated spoons that James Monroe had purchased years earlier in France, Van Buren added the finest quality cut crystal wine glasses, water bottles, and goblets. Before the election of 1840, Charles Ogle, a Whig Congressman from Pennsylvania, rose to speak in the House of Representatives and launched into a three-day attack on Van Buren’s luxurious lifestyle. During William Henry Harrison's presidential campaign, hard cider flowed so fast that he became known as the “Hard Cider Candidate.” To feed his many rowdy supporters, Harrison’s cooks served an election dish called Burgoo, which was made by dropping chopped vegetables into warm squirrel stew! In 1848, Polk signed the Treaty of Guadalupe Hidalgo which ended the Mexican American War and gave most of present-day Texas, New Mexico, Arizona, Colorado, California, Wyoming, and Utah to the United States. The addition of these vast tracts of lands introduced many Native American, Mexican, and Spanish foods to the United States, like Chile Rellenos, Tamales, and Sopaipilla. Of course, the addition of these lands also intensified the debate over slavery and moved the nation to the brink of civil war. After participating in Fourth of July festivities on a blistering hot day, Taylor ate a large bowl of cherries and a pitcher of iced milk and later fell ill with a terrible stomach ache. Five days later he was dead. At the time, many people believed that Taylor died from food poisoning. Today, most historians agree that Taylor died from gastroenteritis, an inflammation of the stomach and gastrointestinal tract. Sot this dude had eight kids with his first wife Letitia who died in 1841. Three years later, he married Julia Gardiner. Together, they had seven children for a grand total of 15 kids! The Christmas Kittens - "a Lively Intro to Historical Fiction for Kids"
The first cast iron cook stove was installed in the White House during Fillmore’s presidency. White House cooks didn’t know how to use the new contraption so Fillmore reportedly marched to the Patent Office, read the instructions included in the patent application, and then showed the cooks how to fire it up! Find my new page on Instagram! In 1854, President Pierce signed the Kansas-Nebraska Act, which created the territories of Kansas and Nebraska, repealed the Missouri Compromise of 1820, and allowed settlers in those territories to determine if they would allow slavery within their boundaries. The Act outraged many northerners who believed he was supporting slavery in the new southwestern territories and old southern states. Politically disgraced, Pierce became the first president to hire a bodyguard after having been attacked by a detractor with a hard-boiled egg! As president, James Buchanan was often called a doughface. This term originally referred to a mask made of bread dough, but was later applied to people, especially politicians, who were thought to be easily influenced by others. Before the Civil War, the term was usually used to describe Northern Democrats (such as President Buchanan) who sympathized with Southern Democrats and slave owners. Abraham Lincoln and his wife Mary allowed their two young sons to keep all sorts of pets on the White House grounds. One was a wild turkey named Jack with whom Lincoln’s son Tad played with daily. When it was time for Jack to be sacrificed for Christmas dinner, Tad begged his dad to spare the turkey’s life. To this day, the White House maintains the tradition of pardoning a turkey each holiday season! At the end of the Civil War, the South lay in ruins. Southern plantations and entire cities had been destroyed. Without food, many southerners starved to death, and those who survived lost everything they owned. As a result, the government had to figure out how to rebuild the south. As president, Johnson took charge of the first phase of Reconstruction. But his attempt to quickly readmit the former Confederate states into the union and his vetoes of important civil rights bills outraged Radical Republicans in Congress. The House of Representatives later voted to impeach Johnson, but he was acquitted by a single vote in the Senate. Historians say that Johnson’s victory "marked the beginning of an ambitious series of receptions, dinners and children’s parties that would turn the last nine months of his term into an ongoing celebration." The menu for Ulysses S. Grant’s second inaugural ball reflects the opulence of the Gilded Age. A New York Times article dated March 5, 1873, contains a mind-boggling list of dishes served. Among other provisions were 10,000 fried oysters; 63 boned turkeys; 150 capons stuffed with truffles; 15 saddles of mutton; 200 dozen quails; 200 hams; 250 chickens; 400 partridges; 25 stuffed boar’s heads; 3,000 head cheese sandwiches; 8,000 pickled oysters and 2,000 pounds of lobster. But the best laid plans can go awry, even for a president. The weather that evening was freezing and the temporary ballroom had no heat. Guests danced in their hats and overcoats, the food was cold, they ran out of coffee, and, worst of all, most of the decorative caged canaries (which were supposed to be sweetly singing) froze. Fun White House Food Facts! The History Chef at Bay Area Bites! Everything in moderation was the motto of Rutherford B. Hayes. He usually had “one cup of coffee at breakfast” and “one cup of tea at lunch.” Dinner was usually fish or steak followed by a slice of his wife Lucy’s homemade Angel Cake! The History Chef at epicurious.com! James Garfield was one of our most intellectual presidents. Before going into politics, he was a professor of ancient languages at Hiram College in Ohio. He was also ambidextrous and biographers say that he would often show off his knowledge by writing Greek with one hand and Latin with the other! The History Chef on history.com! Benjamin Harrison’s presidency began with a dramatic, three-day centennial observation of George Washington’s inauguration as the first president of the United States. The festivities began on the evening of April 28, 1889 with a reception in the Executive Mansion, followed by a reenactment of Washington’s crossing of New York Harbor by barge under a fuselage of gun salutes and fireworks. The festivities were capped with a lavish banquet, featuring “thirteen wines and thirteen toasts” in honor of the original thirteen colonies. “A Full Dinner Pail” was William McKinley’s campaign slogan in the election of 1896. Because the Republican Party was seen as being friendly with big businesses in the east, McKinley’s advisors believed that the president needed to portray himself as more responsive to the needs of small farmers in the Midwest. Their campaign strategy worked. In November of 1896, McKinley defeated the Democratic candidate William Jennings Bryan in a landslide. In 1917, President Wilson urged families to observe “Meatless Mondays” and “Wheatless Wednesdays” to help the war effort. He assured Americans that conserving food at home would help support U.S. troops abroad and also feed hungry people in Europe where food production and distribution had been disrupted by war. Warren Harding’s White House advisors were called the "Poker Cabinet" because they played poker with the president so often. Historians say that Harding once gambled away a set of White House china dating back to Benjamin Harrison's day! The History Chef at history.com! When FDR moved into the White House in 1932, the United States was in the depths of the Great Depression. Just as Hoover had done in World War I, President Roosevelt and his wife Eleanor encouraged Americans to grow their own Victory Gardens. From California to New York, Americans plowed, seeded, watered, weeded, and harvested victory gardens in backyards, parks, baseball fields, and schoolyards. The idea was to grow enough vegetables through the summer to feed family and neighbors. Any extra vegetables would be preserved for eating during the winter and early spring when the next year's produce was ready to eat. As Supreme Commander of the Allied Forces in Europe during World War II, General Dwight D. Eisenhower’s favorite cold weather military dish was ox-tail soup. Ike was also fond of Corn Pudding and String Beans Almondine and, for dessert, he liked Prune Whip, Frosted Mint Delight and his wife Mamie’s Deep Dish Apple Pie. In an October 1962 speech in Houston, Texas, President Kennedy reaffirmed America's commitment to landing a man on the moon by the end of the decade. Seven years later, on July 20, 1969, as part of the Apollo 11 mission, astronaut Neil Armstrong opened the hatch of the lunar module (nicknamed the “Eagle”) and became the first man to walk on the surface of the moon. The first American astronauts had to eat bland, bite-sized cubes, freeze dried powders and semi-liquids stuffed in aluminum tubes. By the time of the Apollo program, the quality and variety of space food had greatly improved. Apollo astronauts were the first to have hot water, which made rehydrating foods easier and improved the food's taste. The food for most of President Johnson’s barbecues was prepared by a chef named Walter Jetton, who ran a catering business in Fort Worth, Texas, a few hours south of the LBJ Ranch. Calling himself “The Barbeque King,” Mr. Jetton dressed in a Stetson hat, apron, creased white shirt, and string tie, and often had a whole headless cow rotating on a spit beside a smoldering fire! On the day of Richard Nixon's 1973 inauguration, Pennsylvania Avenue was littered with hundreds of sick and dead pigeons. At the president's request, a chemical bird repellent had been spread on the tree branches along the parade route to drive away the pigeons for the day. The chemicals in the repellent were supposed to cause the birds' feet to itch so they wouldn't sit in the trees. Unfortunately, many birds ate the repellent, causing them to get sick and die along the parade route. In his 1979 memoir, A Time to Heal, Ford wrote: [My father] and mother had three rules: tell the truth, work hard, and come to dinner on time – and woe unto any of us who violated those rules. During the 1976 presidential campaign, Jimmy Carter hosted a “Million Dollar Supper” at the home of his mother, Miss Lillian. More than 100 volunteers – referred to as the Peanut Brigade – cooked the food! On January 11, 1989, President Reagan delivered his Farewell Address from the Oval Office. In it, he spoke of his vision of America’s promise and said that “all great change in America begins at the dinner table” in the daily conversations between parent and child. As a boy in Massachusetts, George Bush dutifully ate broccoli every day, along with oatmeal and a soft-boiled egg. At a news conference in 1990, President Bush told reporters, “I do not like broccoli and I haven't liked it since I was a little kid and my mother made me eat it and I'm President of the United States and I'm not going to eat any more broccoli.” Needless to say, broccoli growers got a little “steamed” by the president’s comment. Within a week, broccoli growers in California had shipped ten tons of the flowery, green vegetable to Washington D.C. where it was donated to homeless shelters to feed the hungry. In a nationally televised interview during the 1992 presidential campaign, Hilary Clinton said, “I suppose I could have stayed home and baked cookies and had teas. But what I decided to do was pursue my profession.” At the time, many Americans interpreted her comment as a criticism of women who had chosen to stay home to raise their children. In a light-hearted gesture, Mrs. Clinton later served cookies at a press conference and had thousands of cookies distributed at the 1992 Democratic National Convention. When George and Laura Bush moved into the White House, they deliberately departed from the oversized banquets of the Clintons. At their first state dinner, held in honor of the new Mexican president Vicente Fox, the Bushes served Pumpkin Seed-Crusted Bison Steak and both presidents appeared in tuxedos and cowboy boots. During the 2008 presidential campaign, Barack Obama was “pleased to eat pretty much anything,” from grilled fish and Planter’s trail mix to cheeseburgers and ice cream. During his weekly lunches with Vice President Biden, President Obama usually orders up a cheeseburger, chicken or fish and requests his favorite organic drink called “Honest Tea.” His favorite flavors are said to be Green Dragon and Black Forest Berry. Throwback Thursday -- and I'm throwing it way, way, WAY back!! Family Stay-cation - July, 2014! Our "First Date" Anniversary with Four Kids! Who ARE all these kids and why do they keep following me around? Our Katie Girl cheering in "Cheer for a Cure" Championships with awesome athletes of all abilities! Yes, I Tend to Agree. Those Hoe Cakes WERE a Bit Mushy Today! Well, I'm Sorry, George! Maybe I Put Too Much Water in the Batter! Why Don't YOU Make Em Next Time! Hey, Uh, We're Kinda Hungry, George! Can We Maybe Swing By a SUBWAY? Now, You Boys Unload Those Supplies Whilst I Take a Gallop Through the Countryside! Chop, Chop! General George Washington and his staff welcoming a provision train of supplies for the Continental Army. I'd LOVE to Stick Around and Accept Your Surrender! But I've Gotta be Home for Dinner by Four! I Have Only ONE Question Before I Submit My Resignation! Do These Yellow Pants Make Me Look Fat?! How About From This Angle? And, Uh, Maybe This One...? Sir, We Have Deliberated at Great Length and Unanimously Agree That You Should Wear Black Pants! OK So Maybe I Shouldn't Have Worn White Sports Socks Today! But WHO Turned the Phillies Game Off?!! OH DRAT! I Forgot To Take Out the Trash! Abigail's Gonna KILL Me! Serves Him Right! That Driverling Little FEDERALIST Twit! Children! Supper Shall Soon Be Served! So Please Do Go Tidy Up and Put on Some Nicer Clothing! Okay, So Maybe We Shouldn't Keep Score! Thanks for Stopping by THE HISTORY CHEF!